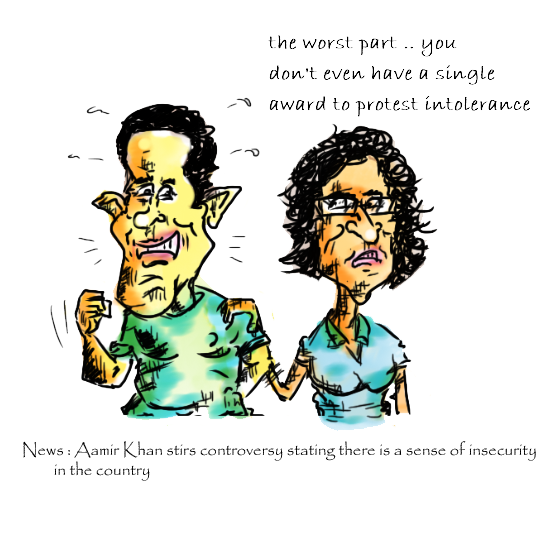 Actor Aamir Khan’s controversial statement that there is a sense of insecurity in the nation and that his wife Sunita Rao asked him to leave the country has sparked the much expected controversy in the nation. Security has been increased around his house as Hindu Sena cadres protested in front of his house. If this is yet another old publicity stunt or a genuine expression would remain a matter of speculation. The sudden “intolerance” against a little too much hyped incidents of “intolerance in the nation” by few acclaimed personas has given reasons to many opportunists to “bake their bread” . hahaha.. true that.. thanks a lot sir for illustrating my own thoughts even without knowing me..
hahaha.. keep up good work sir.. all the best..
he was not correct here. he has given apology letter for that too.